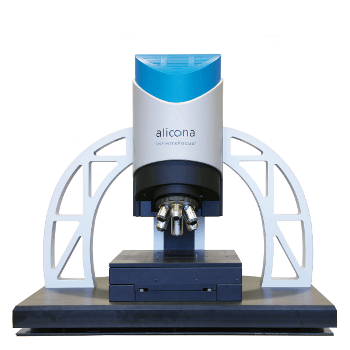 InfiniteFocus, available from Alicona, is a fast and highly accurate optical 3D surface measurement system. It combines a surface roughness measurement tool and a 3D micro coordinate measurement device in a single system for the users benefit. The system uses an enhanced LED ring light and coaxial lighting to provide a complete surface analysis. Additonally, all of the InfiniteFocus axes are integrated with highly accurate encoders to ensure stage movement with high precision. InfiniteFocus provides high accuracy, high resolution, and high repeatability, enabling users to achieve traceable measurements. Its automated settings for measurement parameters enable multiple users from different groups or departments to handle the system with confidence and ease. The integrated Focus-Variation technology combines the depth of an optical system’s focus with vertical scanning to deliver color and topographical information from the focus variation. With Alicona, we have reached the next level in the manufacture of tools with complex geometries. Thanks to the fast and highly accurate measurement technology, we are able to manufacture also special tools precisely and economically. We are proud to be using one of the world‘s leading measurement systems -if not the leading measurement system -with Alicona.